People always roll their eyes when my students and I tell them that we’re doing fieldwork in the Bahamas. ‘Fieldwork, eh?’, they say (because most of them are Canadian). The implication of the rolling eyes is that we’re obviously off for few weeks of R&R, where neither R means research. I would like, once and for all, to dispel the myth that tropical field researchers are layabouts who have a cozy gig going on. So here’s a pictorial account of some of the hardships of tropical marine biology (or what we look like after 2 weeks of fieldwork at the Cape Eleuthera Institute). Beware, the pictures are not for the faint-hearted! Collisions with corals don’t happen very often (because we have great buoyancy!). When they do, corals inevitably win. 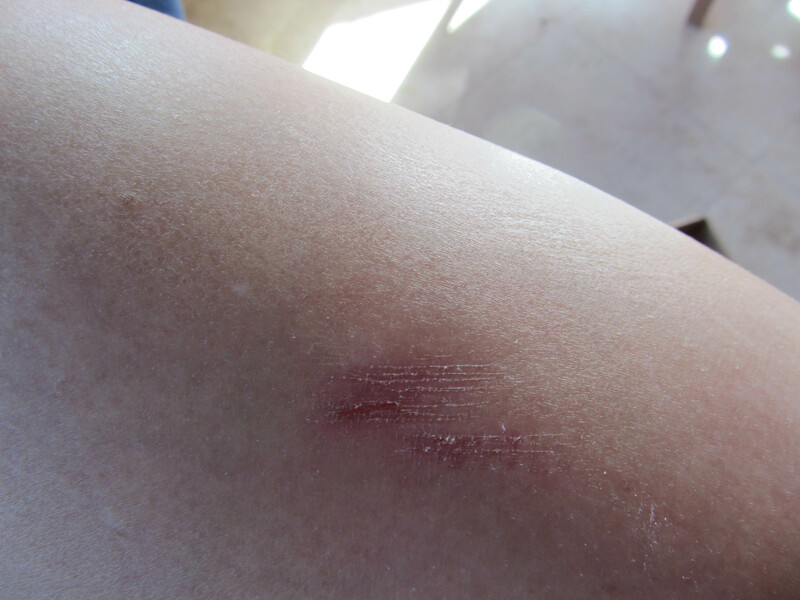 This graze on Emily’s leg is light – evidence of a little brush rather than a mighty crash with a carbonaceous opponent. They weren’t kidding when they named fire coral. The slightest touch yields a stinging sensation that intensifies over time. 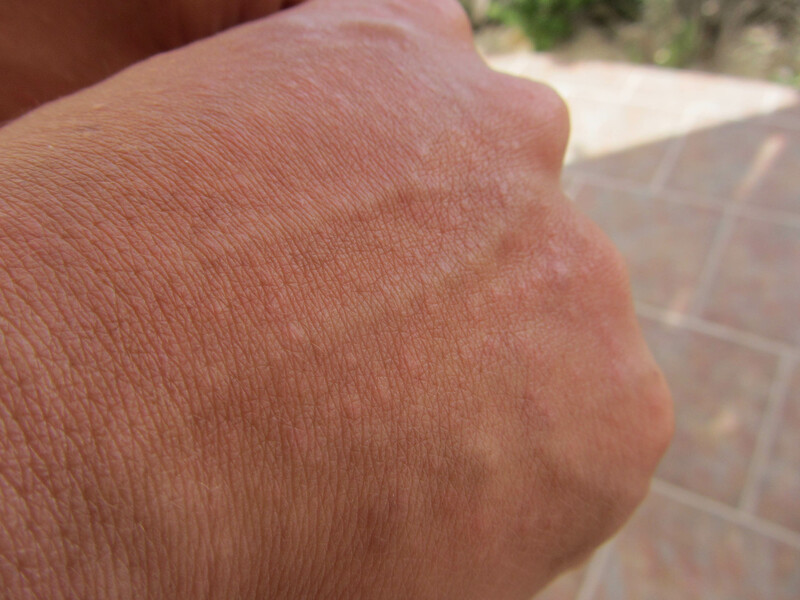 Out of the water, painful red welts develop, which can take days to subside. 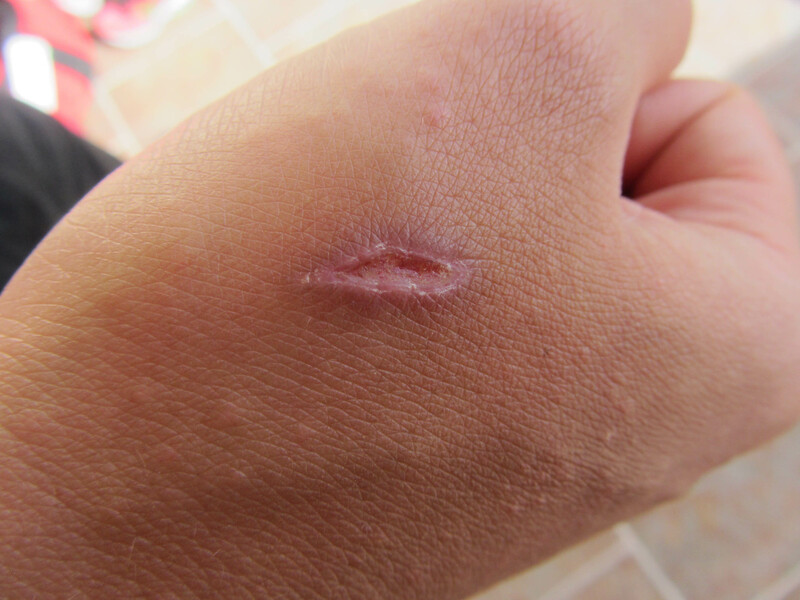 The ‘victim’ is then left with temporary scarring reminiscent of a burn, like what I’m displaying on my wrist. Take-home message: stay away from fire coral! We get one or two of these in each field season. Sometimes they disappear quickly, but sometimes, like the one on Fiona’s hands, they last longer. 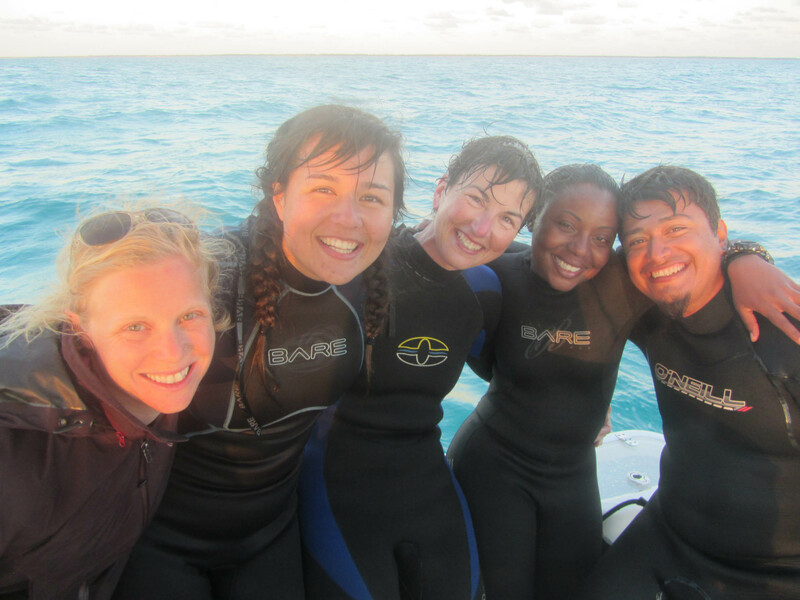 PhD student Nicola – a Bahamian native – called it a ‘sealice’ itch. Obviously not the parasitic copepod that plagues salmon. This one is a tiny stinging jellyfish that clearly has a predilection for people with alliterated names (e.g., Fiona Francis). These cuts start innocently enough. In this case, Fiona (again!) was ‘saving’ Luis as part of her Rescue Diver training at the start of the season, and she cut herself on a sharp edge of the boat. Fi has been in the water 4-5 hours a day, every day for the past two weeks, so the little cut has grown into a crater just about large enough to be picked up by Google Earth. I’m cheating a little here. This one didn’t happen this year; it happened last year at the same field station. It was so spectacular that I just had to include it. I was savagely attacked by a wooden bed frame, that jumped into my path to the loo in the middle of the night. I photographed it every day until it disappeared (something for another day). 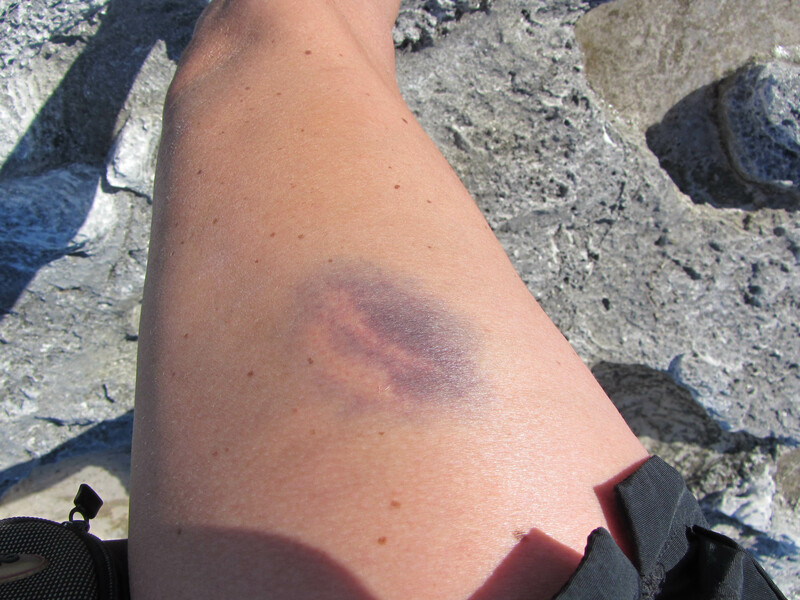 Most of our bruises are not this huge, but we have many, from encounters with docks, boats, scuba tanks, etc. We work really long days in the water, but we still have time, early in the morning or just before dinner to exercise. 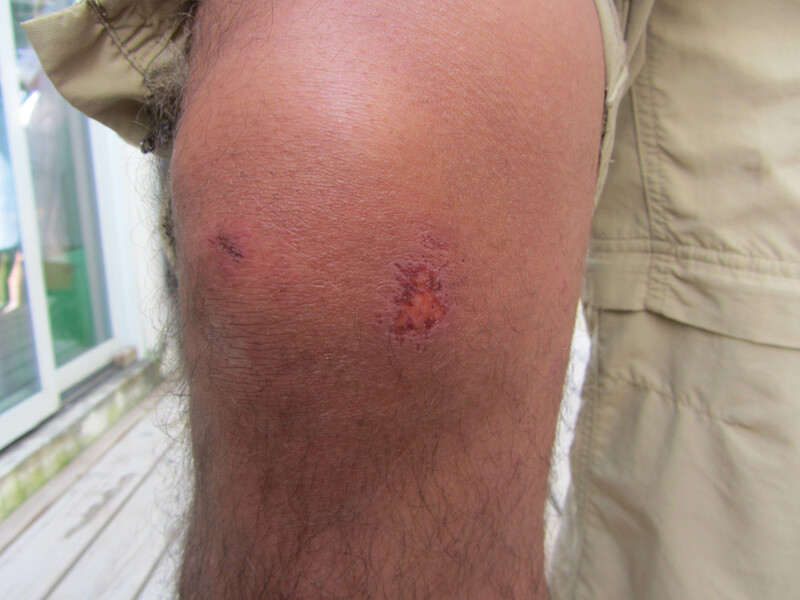 We run, swim, play ultimate, and sometimes fall, as Luis demonstrated. 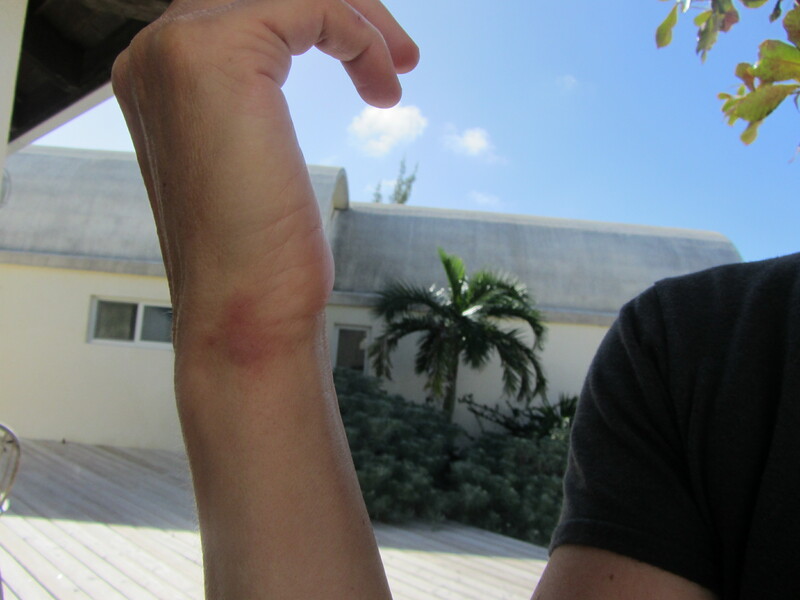 OK, it’s not strictly a fieldwork wound, but if we weren’t so tired from fieldwork, perhaps we wouldn’t trip so often. I’ve kept the most gruesome for last. This is my ankle, after two weeks of having a new wetsuit leg rub on it. Eeeeew! Now that our main data collection is done, I’ve had it attended to. It was unbelievably painful, but not painful enough that it couldn’t be documented in photos! I have to keep it dry for a few days, doctor’s order. Mmmm, we’ll see about that. We may be bruised, bashed and battered, but we wouldn’t trade our fieldwork for anything in the world!